10' wide. Keep it "Moms Kitchen" or personalize it with her name or any phrase or words you would like. Personalize your special chef's kitchen! Show your appreciation for all those delicious meals! Makes a great gift. 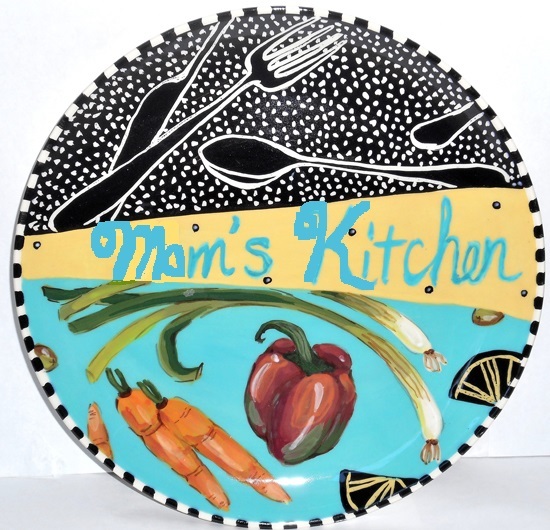 Show Mom how much you appreciate her with this personalized plate! We don't keep an inventory, all of our pieces are hand made to order. The collection of patterns on this page are our most recent or most popular patterns. We have many, many more to offer. Click on "Shapes" and "Gift Ideas" from our side menu to view them. Please allow 4 to 6 weeks for delivery.